Villa Paraiso is a Luxurious, private 6 bedroom Oceanfront villa that offers a vacation experience unparalleled anywhere else in Mexico, famous for its impeccable staff of 13, eager to pamper and cater to your every whim. Villa Paraiso is the ultimate private getaway. 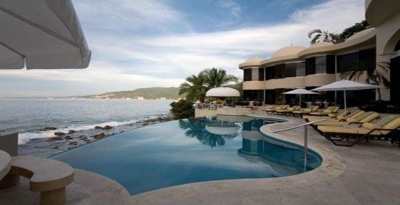 When you enter the property you will see how the Villa was designed to take full advantage of the majestic ocean views. This spectacular property includes 6 beautifully appointed oceanfront bedrooms: a secluded master suite and 5 guest suites, each with its own private bath, ocean-view Jacuzzi, air-conditioning, separate closet area and flat screen TVs. Villa Paraiso is 13,000 sq. ft., built on two levels with spacious living areas, cathedral ceilings, richly designed furniture, original artwork, dramatic floor length tinted windows which open onto an expansive marble terrace that looks out over the famous Los Arcos National Marine Park, a landmark rock formation and underwater sanctuary of coral reefs, volcanic coves and exotic marine life. Watch Dolphins and Manta rays splashing about from the comfort of your terrace with its 45' heated infinity pool, Jacuzzi and bar. In season (November thru April) see Whales with their Calves breaching and putting on a show that you"ll think is special just for you as they frolic in front of the Villa. Or put on snorkel gear and step into the deep blue waters and experience the marine life first hand, where you'll find Sea Turtles, Angelfish, schools of Tuna and an abundance of other Fish. People pay to tour this Marine Sanctuary everyday and you have it all to enjoy at your leisure right in front of the Villa Paraiso. And when the Pelicans come home at night to roost on these rocks, they will soar above your heads to add more magic to this amazing location. People who have been to Villa Paraiso say "this truly is Paradise." After dinner (while sipping your cocktail) watch a beautiful sunset or the sparkling city lights of Puerto Vallarta just 10 short miles away. When lit up at night, the opulence of Villa Paraiso shines like a star, The Crown Jewel of Puerto Vallarta. Villa Paraiso is 5 Star Luxury at its finest with a full service staff of 13 there to take care of your every need 7 days a week. Your villa Manager Mark, is English and he is your own personal Concierge, Mark does the grocery shopping, organizes your meals, arranges transportation, tours, golf times, massages, manicures (in the comfort of the villa) whatever you desire. Our two very talented Chefs will prepare you 3 meals a day plus snacks and appetizers, in your choice of Authentic Mexican or various International Cuisines. You have 3 attentive Waiter/Bartenders, 2 Maids, day and night Security, and a Maintenance/Gardner person. Just sit back, relax and enjoy the pleasures of a truly pampered vacation. A 16% tax and a 2% room charged are levied per. rental. There is a 50% deposit to book the Villa and that must be paid 5 days after reserving the home or you risk losing the rental. All rates and rentals are set once you pay the deposit. The remaining balance is due 60 days prior o the rental date.